Survivors: Series 1 – Revenge | Warped Factor - Words in the Key of Geek. Andrew East nears the end of series one of Survivors. When I look at television series which have stuck with me and become real favourites, I realise that an ‘anthology’ format tends to appeal more than continuous arcs across a number of episodes. I like a ‘monster of the week’ approach which is why Doctor Who will always be my all time favourite show – a new time, place and foe every week (even with the modern series’ penchant for overarching storylines). Other shows I rank highly include Quantum Leap, Supernatural, Farscape and Blakes 7. All of these, to a higher or lesser degree include that ‘monster of the week’ format at their core. That isn’t to say I don’t like the continuous series. Orphan Black is one of my all time favourite shows (I’ve still to catch up on Season 3) and that is very much NOT ‘monster of the week’. Survivors is far closer to Orphan Black in its structure than Doctor Who, particularly now the community is settled. At the beginning there was an element of ‘survivors-of-the-week’, but now, as we come to the end of Series 1, we are firmly placed in a series which rewards watching every episode. You could watch some episodes in isolation (the last episode, The Future Hour, singularly failed to follow-up on the bombshells of Law and Order, for example) but on the whole, not. Revenge is an episode which requires you to have watched the beginning of the series and to remember a character we left behind in Episode 2, Genesis. Anne was the woman met by Greg who left Vic, now part of the community, for dead – to be discovered by Greg in Spoil of War. Anne was a spoilt, selfish woman, desperate to find a man to look after her and keep her in the manner to which she had become accustomed before the apocalypse. In Revenge, we are reacquainted with her and discover she has met a man called Dominic. They arrive at the community and Greg recognises her. He tells her that Vic is alive and living at the community but, as Vic has just attempted suicide, he decides not to tell Vic of Anne’s arrival. Eventually, of course, Vic finds out (via the indiscretion of the two children) and the episode becomes very tense as he confronts Anne about leaving him for dead. The fact that the relationship between them is written as incredibly complex is to the episode’s credit. It refuses to paint Anne as the villain and Vic as the victim in such broad strokes, preferring to contrast Anne’s desire for survival against all odds with Vic’s desperation at his disability and reliance on others. The oddest thing about this episode, though, is Vic – or rather the actor. Up until last episode, Vic had been played by Terry (Seeds of Death) Scully. 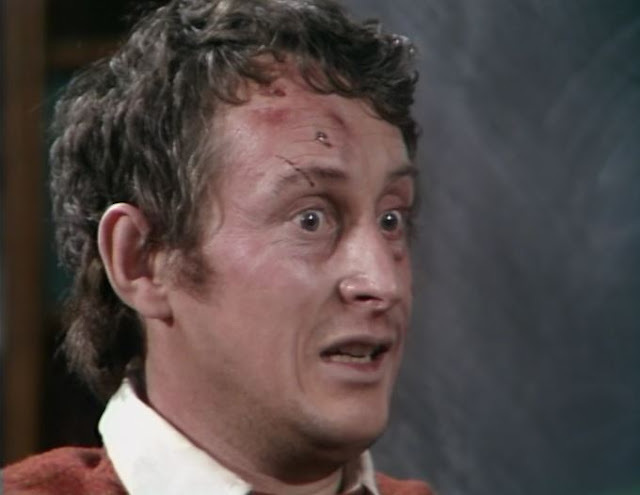 All of a sudden, as this episode opens with his suicide attempt, he is played by Hugh (Deadly Assassin/Revelation of the Daleks) Walters. Sadly, Terry Scully had apparently suffered from a nervous breakdown necessitating his replacement. This a particularly sad for an episode which focusses almost exclusively on Vic as Scully had done a lot of hard work with an interesting character, suffering from the apocalypse in a different way to the others. Walters, though, immediately takes the role and drives the character through his most important episode. I’ll be interested to see where his character now goes or whether Vic fades into the background in the same way Jenny already has done, now that more interesting characters have been pushed to the fore. The end of the series is only two episodes away. I wonder if this strength of this episode can be sustained across the last two and I do hope it is, particularly for the finale. Survivors’ main strength has been its characters rather than its plots and it is at its best when it focusses on a smaller cast (with the exception of the large ensemble piece of Law and Order). I hope that is where the final two episodes are steered.